Are you warming up to Fall yet? Or are you in denial and still sporting open toed shoes and capris? I am in the second camp, but I cannot hold on anymore. The morning temps are hitting mid to low 40s and I have come to accept that not just Fall is here, but we are in the thick of it. And Winter is just around the corner. Yikes!! Each Winter somehow seems much worse than the ones before. My first Winter in America was in Upper Michigan. Imagine the delight of a gal from South India, who has never seen snow before, landing in a place where there is record amounts of it. But I landed there in Summer, when everything was gorgeous. When Fall came, I could not get enough of the Fall Colors of Keweenaw Peninsula set against gorgeous Lake Superior. Enter Winter, I was fascinated by snow. It always looked pristine and post-card perfect. I took enough pictures to send home, posing in front of the of the snow clad pine trees, cars buried in a pile of snow, and the huge snow banks. And then my delight fizzled out but the never ending winter kept going. My fascination for snow lasted for, well…about 4 weeks. And I was in a place buried under snow for about 5-6 months. I graduated and moved. To Michigan. Yes, from Upper Michigan to Lower Michigan. While I did not get any respite from snow, it only got worse as the pristine beauty of Upper Michigan was practically non-existent here. But I was offered other exciting avenues in culinary world. With a large population of Lebanese in Dearborn, I had access to the best Lebanese food in the country. Seriously! I was addicted to hummus, majadra, shawarma just to name a few. I had withdrawals after moving from Michigan. Store bought hummus did nothing to improve it, but under the circumstances I have accepted it. 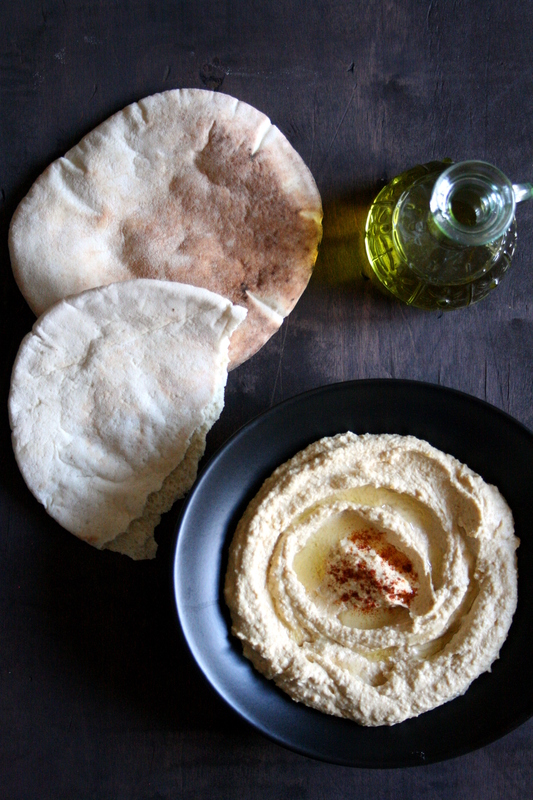 After figuring out how to make better hummus at home, there was no looking back. But I still miss hopping into my favorite restaurant at the drop of a hat and wolfing down hummus and shawarma, without lifting a finger. My go to recipe is of course an amalgamation from different sources as well as intuition and adaptation to my taste buds. Ottolenghi’s hummus is wildly popular on the internet because it has tips on how to achieve a smooth consistency while keeping the chickpeas skin on. I was frankly surprised that the ‘trick’ to use baking soda was not a known fact to many. Using a pinch of baking soda and pressure cooking chickpeas is like next to adding salt to a dish to anyone who is raised in India and cooks. So I have always had great results in the consistency, especially when I use my ‘Indian Blender’ that I normally use for making chutneys and batters. 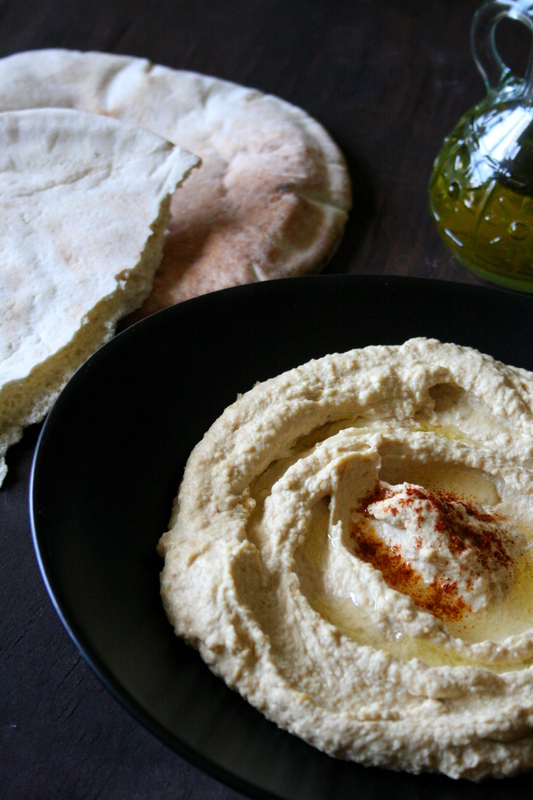 I made hummus in food processor too, but could not achieve the store-bought smoothness. It nevertheless tasted so fresh and pure. While you can modify the ingredients to your taste, please, oh please, do not use canned chickpeas. Start with dry chickpeas and soak them overnight and cook. This alone will make a world of a difference. Trust me on this one! • Cook the soaked chickpeas with baking powder in pressure cooker with 5 cups of water for 5 minutes on high. Let it cool. If not using pressure cooker, cook them with baking soda and enough water until they are almost mushy, about 20-30 minutes on medium high. Skins will be coming loose at this point. Drain the chickpeas after cooling. • Put the drained chickpeas in a blender and add salt, crushed garlic, lemon juice and cold water and blend until almost smooth. • Add Tahini and blend until smooth to your liking. Taste and adjust seasonings. If needed, add a tablespoon of water to run the blender. • Serve it drizzled with Olive Oil and Sumac or any other garnish of your choice, along with warm pita or any rustic bread or raw vegetables. It also makes a great spread for sandwiches and toasts. This entry was posted in Appetizers, International, Recipes, Snack, Vegetarian. Bookmark the permalink. I love hummus so much… It’s definitely a staple in my household, however I am usually really lazy and just buy it from the store. But if the recipe is this easy, I definitely have to make it! Thanks for the idea.